For this reason I've created this Android proguard.conf generic starting point template. If you've know any other common config lines let's have them and I'll update this post accordingly. # Removes all calls to Log. Delete the methods you want to keep. After making my first million :) I've decided that my Slashdot Reader Widget should be free. There are no annoying adds or anything else to lessen your experience - just the fully functional version for you to enjoy at no cost. As soon as I released the original version of the Slashdot widget, I realized that Android 3.0+ (honeycomb and ice cream sandwich) allows natively scrollable widgets (at least in the vertical direction) and this is much nicer on bigger screens, no such luck for Android 2.3 (Gingerbread) or prior versions of course. The nice thing about Android and the Market Place is that it's relatively easy to work around this using the android:minsdkversion and android:maxSdkVersion elements of AndroidManifest.xml. At this point I've developed 2 versions of the widget. 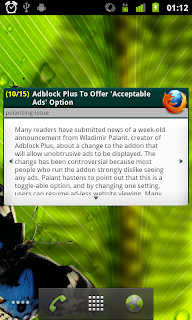 Imagine there used to be no Android widget for Slashdot, simply unthinkable! I learned this when full of confidence I looked for one on the Android Market place and came up with nothing. I’ve been a Slashdot reader for years, I’d even go as far as to say that ./ is then only source of news I check regularly, and now this. It has been quite a while since I’ve last put up a post. Much has happened since then. Trying to get Maven and Eclipse RCP to work together to produce a build has been a complete nightmare. A member of my team spent a week trying to accomplish this feat and the end result has been hindering development ever since. Every time the plugin dependencies change, which in a young project is quite often, we're forced to update number of files by hand to accommodate the build process, which is fairly complex so that only one person on the team really knows what the hell is going on. I wouldn't believe how difficult something like building an RCP app with Maven can be, if I didn't live through it. Very frustrating stuff. Especially given that we're all quite happy with the way the actual RCP application has turned out. It seems one cannot get away from Maven now a days. In my current job as well as in my new job (which I start in a few days) we'll be using Maven to build and manage projects. "I hate Maven and the open source community!" It was clear that given the extensibility requirement we needed a platform. It came down to a choice between NetBeans Platform and Eclipse RCP. In the end I chose Eclipse RCP because I was able to step through this tutorial with complete ease and I felt that even though I have experience with the NetBeans platform my team mates would be faster in picking up the Eclipse RCP way of doing things. Now, a month later, I have to say that I believe that my decision was the right one. After 3 days of tutorials and reading we were ready to go. Ultimately we have created a UI which is modular (with multiple self contained plugins), looks and feels the way our client expects, and will be easy to extend. In addition, majority of the actual UI work (using JFace, SWT, databinding, Eclipse RCP APIs) was done by my colleagues while I focused on the data models. While I would take the NetBeans IDE over the Eclipse IDE for most things I am quite happy with the way our RCP based project turned out given the requirements. To send Java log records to from GlassFish to chainsaw we need to first translate the LogRecords (from java.util.logging) to LoggingEvents (used byt the log4j framework and accepted by chainsaw). Then also need to publish the resulting LoggingEvents to Chainsaw over a socket. In case you are curious how it works or want to add functionality or fix a bug here is the source. In this post I will give an overview of the architecture that I've used to supply a connected thick (JavaFX) client application to a customer. Here is the scenario: our company has an important customer who wishes to access and view some real-time data related to their business. There are a few issues with this set-up. Simple enough Web Service deployed on GlassFish v2.1 JavaEE 5. Nothing special to note here. The client (once launched) uses the WS location property to connect to the correct web service. The servlet gets this information from system properties which can be easily set using the GlassFish web admin console. This means that we compile the code once and deploy it to any GlassFish server and all works well as long as we don't forget to add the two properties to the server. I am a software developer living in Sydney, Australia. My interests revolve around mobile application development. Ever since the creation of J2ME over 10 years ago I've loved mobile app development. Recently I've been working on Android and iPhone apps.